Anybody know of a solvent for ABS that does not affect PLA so that we can reverse the roles? Acetone seems to dissolve PLA as well. Actually I didn't mention it, but I also put a piece of ABS raft in a cup of (fairly concentrated) caustic soda. 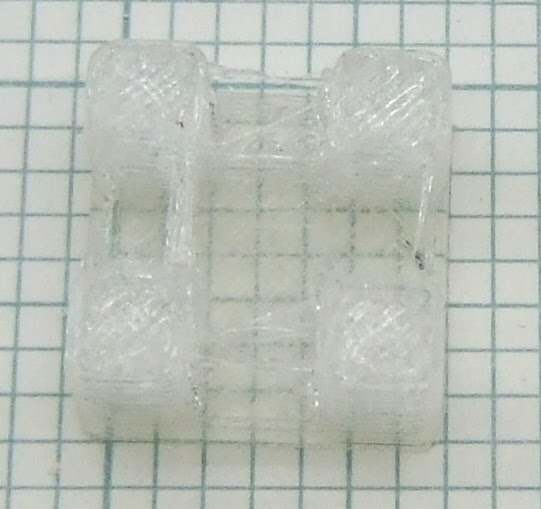 While a short rod of PLA filament became shorter and shorter (until the solution was saturated), the ABS seemed unaffected by this. I do wonder what the environmental impact of caustic soda (a.k.a. lye) is (might be especially bad before it has reacted with anything). Luckily, what our experiment pointed out is that it is probably possible to control the strength of the weld between ABS and PLA pretty precisely, so you can have to software generate easy-to-break bonds. In this way, you don't need to use a lot of solvent. For many objects you might be able to break away all sacrificial material. Not sure whether this would leave scars on the object, but looking at the seam between the two objects we might be able to avoid this. Even in case there is still a film or some grains of PLA left, it would require a minimal amount of solvent and probably won't take long. I hadn't thought of this, but Nophead pointed out that it might even be possible to the dissolve ABS while keeping the PLA object. This way we can still make objects of either material. At least something to keep in mind. It looks like all my organic chemistry/biochemistry classes might actually come in handy. PLA is a biodegradable plastic with bonds that can easily by hydrolyzed. All we need to do is find a non-specific enzyme or a catalyst that can take care of them. We can then obtain them from biological sources. Nophead, as your experiment with Lye showed, you can also hydrolyze ester linkages with bases or acids, but there's a significant activation energy barrier that prevents a useful rate of reaction. There's significant energy available in the ester bonds though, so it's a spontaneous reaction (which is very good for us). I don't have PLA handy, but you can also try using ammonia to do a nucleophillic attack on the molecule. The optimal solution would still be an enzymatic or catalytic one though. If anyone has contacts in an organic chem department, now would be the time to use it. This has huge potential. Thanks Matt! I think we should pursue alternative (such as you mentioned) to NaOH/lye since it's not people friendly and probably not eco-friendly. Has anyone tired biological washing powder. It has the ability to dissolve organic material through enzyme action. I think it works best of warmed up. It is what they use in the CSI programs to remove organic material from skulls etc before dong a time team thing and catching the bad guys. It would really help if we could figure out what kind of enzyme the washing powder used. The ester linkage present in PLA is also similar to the one binding glycerol to fatty acids in triacylglycerol (lipids). If the washing enzyme contains lipase, it may make a significant difference (depending on how much it depends on the fatty acid tail). Do you have a website for these washing powders? I'm still trying to think up of a biological source where we can obtain these enzymes as well. No need to add another vitamin/mineral to the list. I found an article that might be of interest to our PLA catalysis efforts. It seems that is enzymatic approach is possible, although it is still very new. We may need to purify the enzyme from a bacterial culture. You'll need an academic subscription to read it unfortunately. I'm not sure if we have some way around this. The details of the chemistry etc is a bit beyond my capabilities. The thoughts are largely a free wheeling thing and an is it worth trying something thing. The washing powders are the sort that are used for cleaning clothes (dishwasher detergents ie for dishwasher machines may actualy do the same) and advertise themselves as being biological, removing stains through biological action. I think Aerial is an example of one. I saw a similar thing on a TV program once about how to commit the perfect murder. The program was looking into the best way to dispose of a body. The technique of using a biological washing powder was discussed in the program. A peculiarity of the process is apparently that the fats are not digested so you are left with those when the proteins etc have been striped away.